Whether you’re new to sewing and looking for something easy (it’s all relative baby), or an old hand that just prefers not to d*ck around with patterns and tracing and all that jazz (hey, it’s jazz to me) this book is your Higgs Boson. Published by the Textiles & Costume Department at the Royal Ontario Museum (be patient with their website they may be having a bit of a slashdot effect post-twitter linking), this manual covers all sorts of garments from the ROM Textiles and Costume Collection along with the diagrams for reproducing them. You heard me, you can potentially kit out a zero-waste wardrobe using this book. 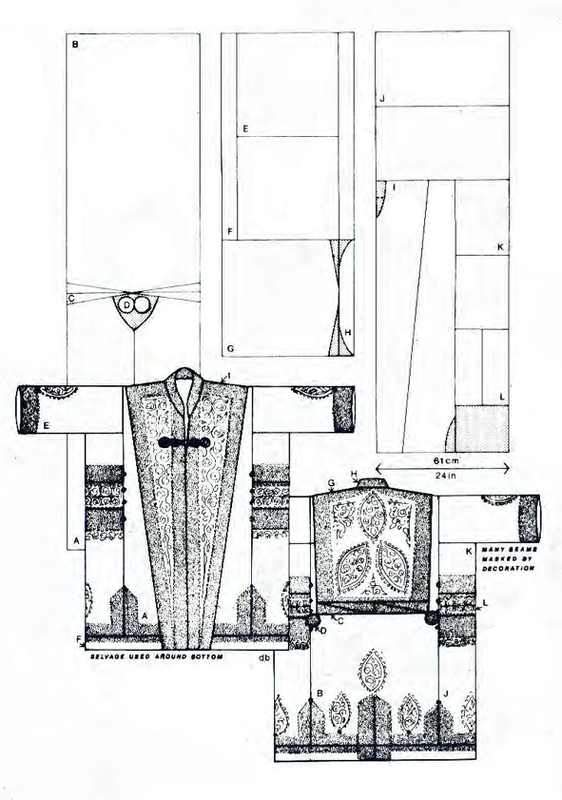 The instructions consist of black and white line diagrams requiring similar strategies as those used by non-natives sewing from Japanese pattern books: i.e. 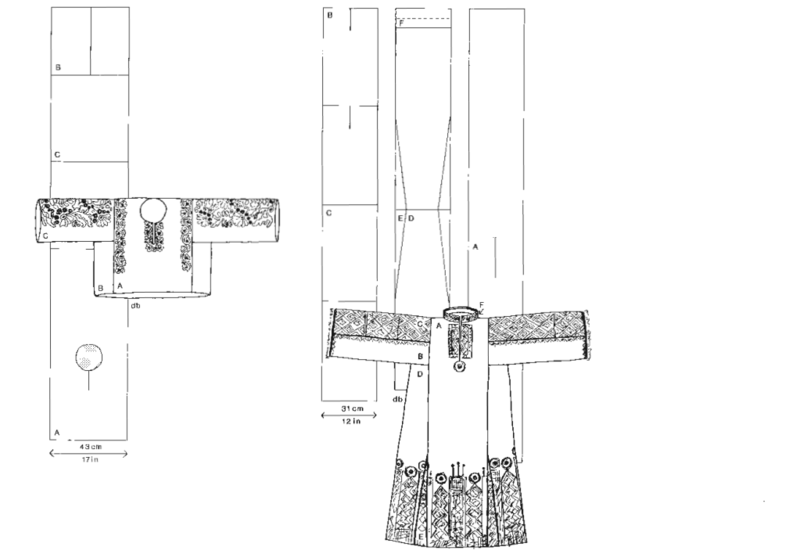 have a quick look at the illustrations, then wing it. The designs range from the simplest ‘square with a hole’ Poncho type (there’s even a square with 3 holes because at some point humans evolved arms) to fairly involved pieces with gathering, ruching and embroidered details. You don’t even have to draw anything out. Just mark it onto your fabric in chalk/ marker and have at it with ruler and rotary tool. I’d suggest making these up in knit fabrics-that way you don’t even have to include seam allowances, just sew everything together with the minimum width stretch stitch your sewing machine/ overlocker can handle and spandex/ lycra will take care of the rest. I am in the process of putting #22 together now. 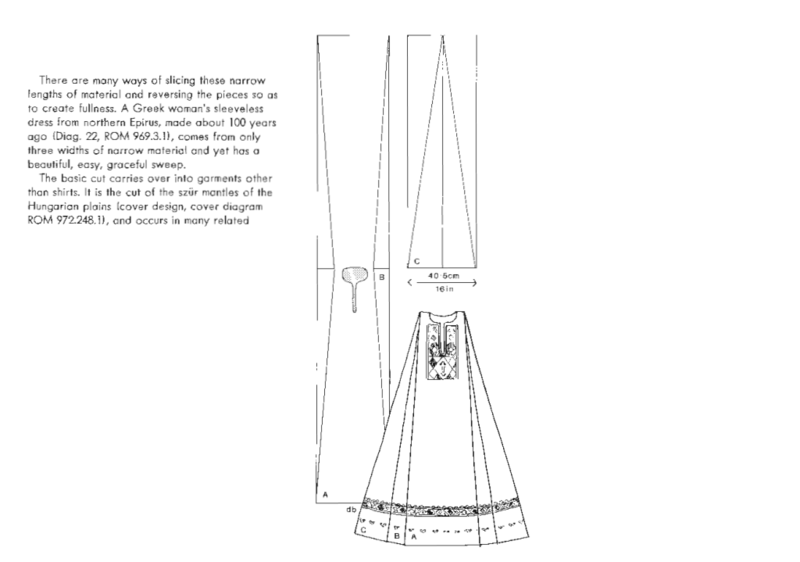 Pros: 28 patternless patterns (hah) in one book with academic references to the ethnic origins and historical uses of every single garment. What’s not to like? Sew ‘em up in black jersey for the edgy urban look or go nuts with brocade for monocle-rocking, Operatic, steam-punk singalongs. You can’t go wrong. I see this book as a bare-bones stepping stone to working out your own compilations on the path to eventual Alexander McQueendom (minus the suicide at the end). I will be making at least one of these up in silk Sari fabric. Cons: None that I can think of. 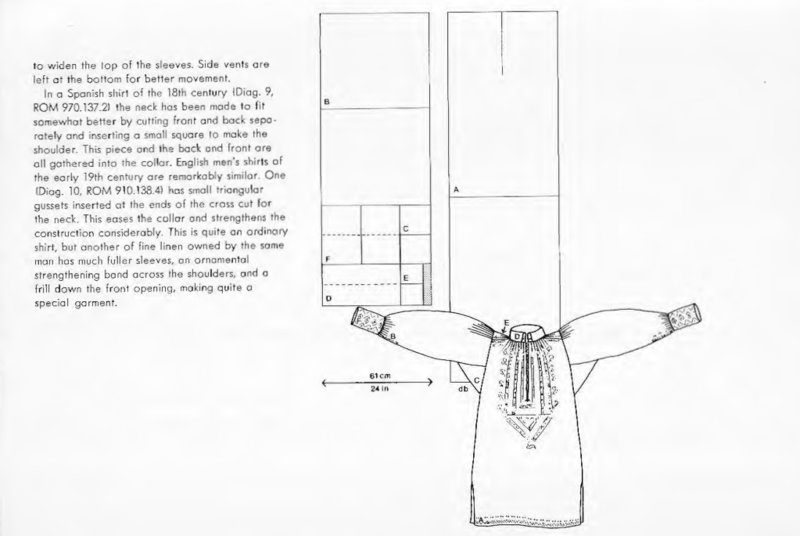 Some people might find the diagrammatic instructions hard to figure out, for these I would suggest starting small with the one and two-piece garments and working your way up to the Korean wrap jackets and Afghan coats. Asides: This is the perfect gift for the history buff with a sewing problem. Or for anyone that likes textiles or vintage pattern making books. If nothing else the cover will look sweet on your coffee table. Conclusions: Buy it here or here. Also, add a museum to your will (your kids aren’t going to be interested in your 1890s herdsman’s coat, trust me). 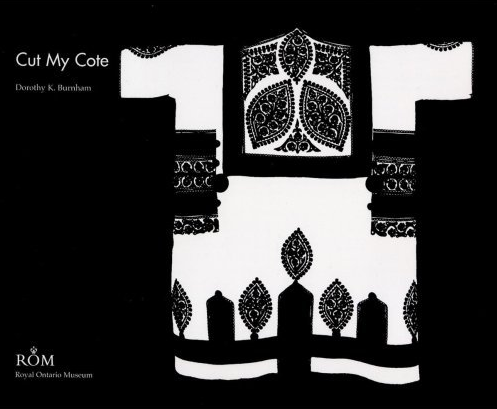 Special thanks to the Royal Ontario Museum (big ups to ROM images and the textile curators at ROM). If you are fortunate enough to visit the area/ happen to live nearby, do drop in and spend some $ (seriously, do it. At the time of writing they have this exhibit on). Or, just visit your nearest museum. Or a library. Libraries rock. And not just for the free internet access. *Image quality/ resolution is a result of scanner misbehave-ment, rest assured the versions in the book are fine. Disclaimer: This review is based on the first Edition, Second Printing (Dec. 1973). All images remain copyright of the Royal Ontario Museum and are reproduced here with permission.